All of these answers are not right. Meditation is NOT about empty our mind of thoughts. Even when I was spending 9 days in absolute silence meditating 14 hours a day in a Buddhist temple, I still was having thoughts. Before we get deep into the principles behind the 3T’s Meditation, let me tell you that meditation is the contemplation of our mind, body, and feelings. Contemplation without judging, without labeling but just observing with detached awareness. Why did I decide to call it 3T’s Meditation? When retreat attendants where experiencing this meditation, was quite usual that they didn’t know how to put into words what they just experienced. Then I noticed that there was a before an after in their mood, in their energy. As a result they were having a transformation in their thinking. So all of this made me came up with three words: Transmutation, Transformation and Transcendental. The transformation happens as a result of creating a bigger vision of your life that is aligned with your heart. There is not really a way to explain what you are going to feel until you experience it by yourself. One of the things that fascinated me the most of meditation is that it opens the door to access our subconscious mind and there we can reprogram patterns of thinking, behaviors and limiting beliefs that have been holding us back for many years. 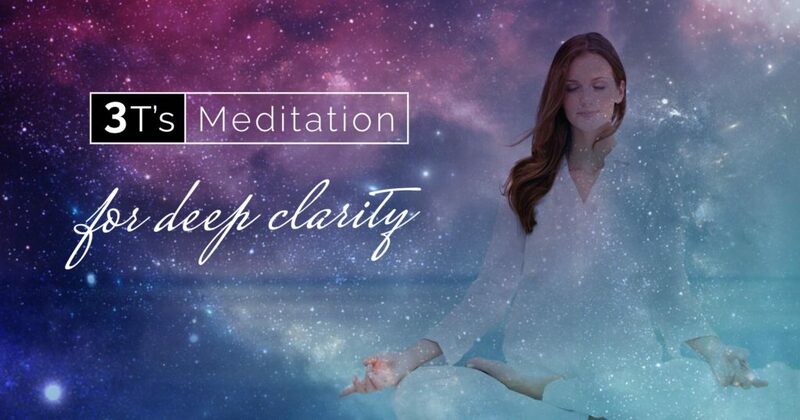 The 3T’s Meditation is not really a meditation, but a deep transcendental experience to access our subconscious mind to incorporate new ways of thinking in different areas of your life. Because it’s when we change the way we think that our results start to change. That’s why we need to transform the way we look at things. We need to transmute the vibration we currently have into higher positive frequencies. All of this brings a transcendental experience that you might not be able to explain with ordinary words. If you know me personally then you know that even being an advocate for spiritual life, I’m a very skeptical person. Usually, I only believe in those things that I’ve found are working or that have scientific pieces of evidence of the results. For the last years exploring different spiritual paths and self-development tools, I’ve found so many interesting things that are really producing extraordinary results in our mind and in the way we see the world. I also had the opportunity of trying these tools with over 100 people that have been attending our retreats, so I know what works best and the kind of experiences they are having. I incorporated hypnosis techniques to make this experience more powerful. I added binaural music in the background that relaxes the brain. I added visualization to make you believe things you probably would not use only your conscious mind. I incorporated the feelings and the gratitude to be in tune with universal laws like the law of vibration and the law of attraction. People are amazed by the results they get from this experience. It’s not something you can find anywhere, but that can change the way you see the world.